Art History, Art History Research, & Art History in Art Making. This lesson has it ALL!!!! Art History is the foundation to many of my lesson. Art History can sometimes be challenging to make exciting to the teenage mind, but this lesson makes art history fun! Are you looking for a great way to integrate Art History, Research, and Art Making/Design into one project? Then this is is the project for you! 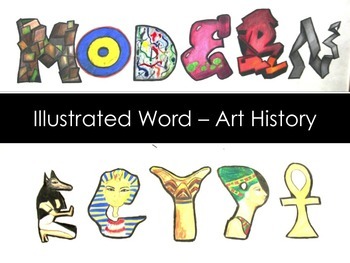 Students research a style of art , using the handout in this packet and create a graphic, illustrated word using art from their selected style. It is a great art lesson, appropriate for middle and high school that marries art history and art making. For the Visual Art Class- Create a Great Design project that incorporates Art History and challenges your students! For Art History Class- Try a new twist on research! So, you need to prep a new art lesson, but don't have the time? are you interested in trying something different? Try one of my art lessons! 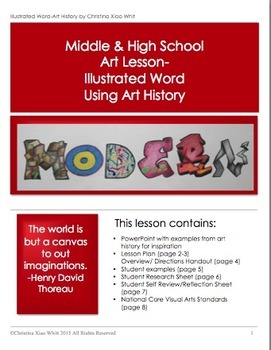 One of my best selling art lessons!Great for middle and high school art classes! A great art lesson with a focus on Magritte! 3 great Art Lessons on Surrealism in one package! 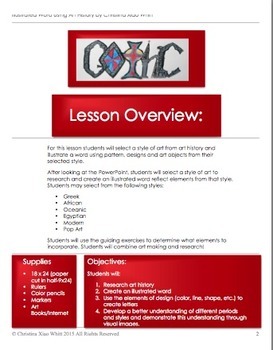 Many of my art lessons have great Powerpoints that can be used with the projects. Check my store for details! This is a great artist research project for Middle and High School art classes or language or history classes focusing on artistic achievement of great artists. Artist Research for Middle and High School art students can be fun and creative! For this project, middle and High school students will research, design, and create an artist research poster project about an artist that gives the viewer a snapshot of the art and life of the selected artist. The poster should reflect elements of the artist’s style and work. Using the library and internet, students will research a selected artist, gather key points about the artist, and use their creativity to design a poster to present their findings in a fun and creative way. I hope this resource is helpful. Please remember it is for classroom use only and is not to be reproduced for others or in any digital/online format. If you like my resource, please follow me. Be the first to know about store discounts, free products, and product launches! Just click the green “Follow Me” star under my store name . Leave a review!!! Your feedback is very helpful!